The program is complex, but extremely good. 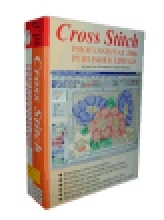 It allows me to create amazingly detailed, accurately coloured cross-stitch charts from both photographs and artwork. Where CSPPP stands out for me is not only the flexibility the program offers (the ability to create very professional looking pdf charts) but the outstanding customer support from Dave Peters, the programmer. He's quick to respond, and very helpful - the program is added to (increasing its usefulness with every change) regularly, and the updates are free for 2 years. You really cannot go wrong with this. It was worth every penny in my opinion - and I've almost made back half the cost of the program less than a month from starting to use it. Another month and I'll be actually making money. Brilliant!